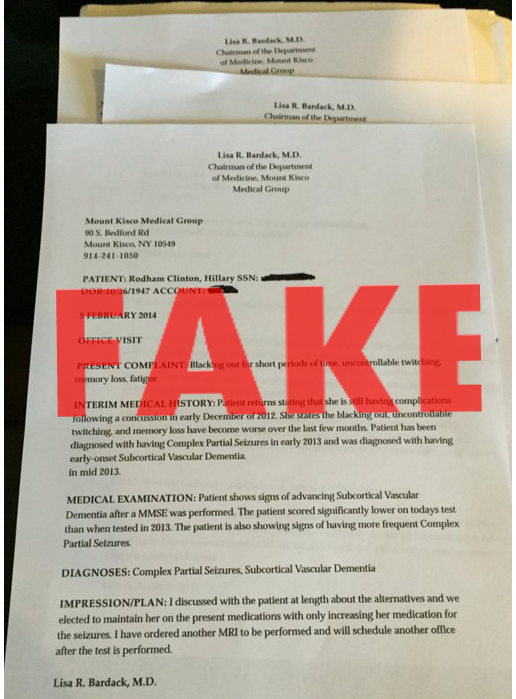 The fake records are making the rounds just as some in the conservative media have been baselessly questioning Clinton’s health. Among them was Fox News’ Sean Hannity, who played a tape of Clinton vigorously shaking her head in a manner he deemed “seizure-esque” (although neither of the medical experts on his program agreed). The fake documents, dated Feb. 5, 2014, which appear to have originated from a since-deleted Twitter account, purport to come from Dr. Bardack. But her title is wrong on the letterhead. The letter purports to indicate that Clinton suffered complications from a 2012 concussion including “blacking out,” “uncontrollable twitching” and “memory loss.” It says Clinton has previously been diagnosed as having “Complex Partial Seizures” and “early-onset Subcortical Vascular Dementia.” The images were shared and discussed on numerous websites and in social media. But again, we can’t stress this enough: It’s a fake document. 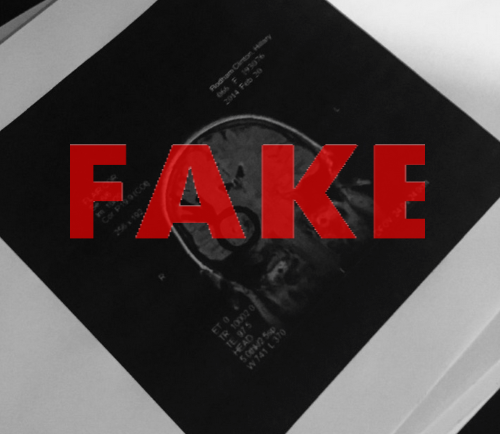 The same Twitter user later posted what was purported to be a magnetic resonance angiogram of Clinton’s brain showing a significant “abnormality” in the brain tissue. This is also a bogus image. Bardack, who has served as Clinton’s personal physician since 2001, did publicly release a summary of Clinton’s health history and a medical evaluation in a letter dated July 28, 2015. It paints a much different picture than the fake documents. The letter discusses Clinton’s concussion — well-documented in the media at the time — and some of the lingering effects she suffered from it. As the New York Times noted in December 2012, Clinton suffered a concussion after fainting and striking her head. Bardack’s letter said Clinton suffered a stomach virus after traveling, and became dehydrated, which caused her to faint. Bardack, July 28, 2015: During follow up evaluations, Mrs. Clinton was found to have a transverse sinus venous thrombosis and began anticoagulation therapy to dissolve the clot. As a result of the concussion, Mrs. Clinton also experienced double vision for a period of time and benefited from wearing glasses with a Fresnel Prism. Bardack said Clinton’s symptoms, including the double vision, went away within two months. Bardack, July 28, 2015: She had follow-up testing in 2013, which revealed complete resolution of the effects of the concussion as well as total dissolution of the thrombosis. Bardack said Clinton’s most recent physical examination on March 21, 2015, “revealed a healthy-appearing female.” Bardack said Clinton has a healthy diet and exercises regularly, including yoga, swimming, walking and weight training. Bardack, July 28, 2015: In summary, Mrs. Clinton is a healthy female with hypothyroidism and seasonal allergies, on long-term anticoagulation. She participates in a healthy lifestyle and has had a full medical evaluation, which reveals no evidence of additional medical issues or cardiovascular disease. her cancer screening evaluations are all negative. She is in excellent physical condition and fit to serve as President of the United States. Despite the public release of Bardack’s medical evaluation, some conservative pundits have questioned Clinton’s health and ability to serve as president. On Fox News, Sean Hannity repeatedly speculated about serious health issues for Clinton. Hannity showed clips of Clinton in the midst of a coughing fit in February, stumbling while boarding a plane in 2011, and dramatically shaking her head during a press scrum in June (which Hannity said “almost looks seizure-esque to me”). Never mind that two medical experts on the program said the video did not appear to show seizures, though both called for a disclosure of medical records for both presidential candidates. Hannity, Aug. 10: That last one in particular is so odd to me. What was your take? Dr. Fiona Gupta, neurologist, North Shore Brain and Spine Center: You know, it’s just so hard to speculate based on snippets of the clips that, you know, what is going on without having a full examination and workup. Hannity: Look at this video right here. Watch her reaction, because I’m not — it almost seems seizure-esque to me. Gupta: There are different types of seizures, local seizures that sometimes can cause just one body part, but it would be very rare. I mean, typically seizures will generalize, so I can’t say that’s a seizure. Hannity: Aren’t there many seizures like that, Dr. Siegel? An opinion writer for Newsweek, who has epilepsy, wrote that Clinton’s movements looked “nothing like” a seizure. The writer called Hannity’s speculation degrading to people with epilepsy, and he demanded an apology. Neither Trump nor Hannity referenced the fake medical documents purporting to be from Dr. Bardack. But their baseless speculation is also refuted by the public statements and medical evaluation released by Clinton’s longtime doctor.